Koster NB 1 Grey Crystallizing mineral waterproofing slurry system for sealing against pressurized water (> 13 bar). 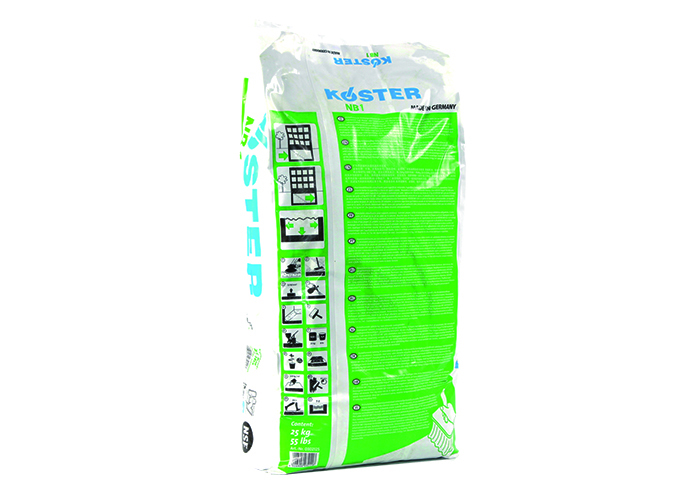 Koster NB 1 is a mineral coated waterproofing slurry containing crystallising and capillary-plugging agents. It can be used for waterproofing against ground moisture and for non-pressurized and pressurized water. NB 1 Grey is characterized by its excellent resistance to pressure and abrasion as well as chemical and sulphate resistance. Applied as a closed layer, Koster NB 1 is waterproof to pressurized water up to 13 bar, due to its penetration into the structural member, the slurry develops an intense bond to the substrate and the capillaries are plugged. Besides the hydraulic curing of the sealing slurry, crystallizing reactions are activated in the slurry which can lead to a self-healing effect when micro- cracks develop. Waterproofing with NB 1 Grey should only be carried out on substrates that are free of moving cracks. Moving cracks should be considered construction joints and treated accordingly with Koster Joint Tape, Injection Resins, or Joint Sealant FS. SB-Bonding Emulsion introduces flexibility to the material.